Razer at a press event in London on Wednesday unveiled its first-ever smartphone, the Razer Phone. Described by CEO Min-Liang Tan as the ultimate in mobile entertainment, the Razer Phone features a 5.7-inch, 120Hz Sharp IGZO display with Ultramotion adaptive refresh rate technology and a quad HD resolution of 2,560 x 1,440. It’s powered by Qualcomm’s Snapdragon 835 SoC alongside Adreno 540 graphics, 8GB of RAM and 64GB of onboard storage (expandable via microSD card slot). It utilizes dual front-facing speakers powered by Dolby Atmos and certified by THX but notably lacks a 3.5mm headphone jack. Tan said it’s “probably” the loudest smartphone out there. The all-aluminum handset packs a massive 4,000mAh battery that’s reportedly good for up to 12.5 hours of movie watching, 63.5 hours of music listening or seven hours of gaming. Thanks to its Qualcomm Quick Charge 4+ technology, the phone can be recharged from zero to 85 percent battery life in just one hour. Around back, you’ll find two 12-megapixel cameras with dual LED flash and up front, there’s an 8-megapixel camera. The phone’s fingerprint scanner is built into the power button. Visually, the Razer Phone looks a lot like the Nextbit Robin – unsurprising given Razer’s acquisition of Nextbit earlier this year. Notably, however, it does lack any water or dust resistance so you’ll have to be careful when using it in damp or dusty environments. The Razer Phone will ship running a vanilla version of Android 7.1.1 although an update to Oreo will be available in the first quarter of 2018. 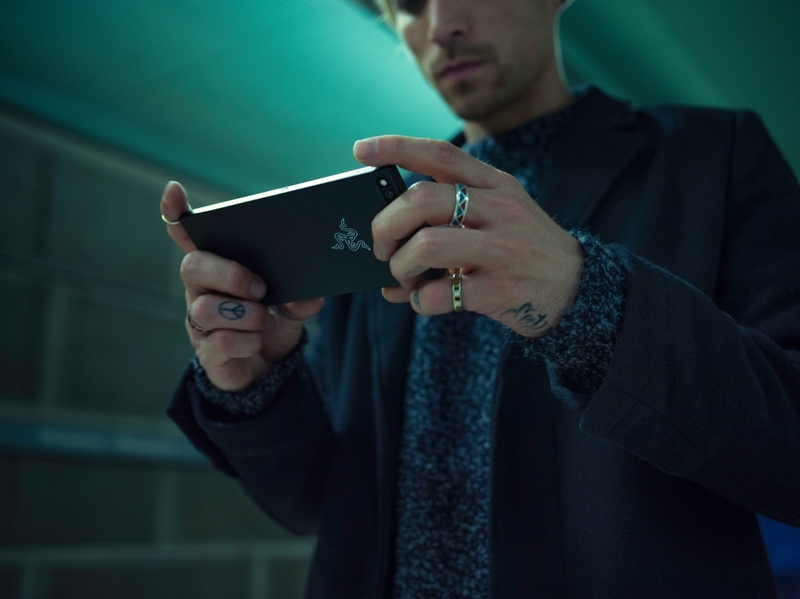 Razer’s first smartphone retails for $699 and ships on November 17. Pre-orders are being accepted from today. 699 is better than id expect from razer, but makes me no less wary of their renowned quality control issues and the lack of water resistance. alabama man and psycros like this. Razer apparently thinks its the Apple of gaming. Wait..
Why make a phone without water res? If your a gamer you will be playing even if its raining. Seems like a missed opportunity not to do something like the xperia play if it's meant to be for gamers and all. A 120hz display and 8gb ram seems like a bit of a waste if you can only play stuff like candy crush and angry birds comfortably without also lugging around a bluetooth controller. Seems like a nice phone, I'm looking forward to a teardown. I would have thought OLED would have been used for a gaming phone to improve battery life and playability in bright areas. I'm also hoping that the battery is easily replaceable, but only time will tell. Crashlands and GTA chinatown wars runs perfectly on my current phone and haven't heard of any other games that aren't based on ads. I'd rather buy switch, it has actual controllers, costs less and has good games. And for 699$ I would buy a gaming laptop or 599$ laptop and a 100$ phone. Maybe 120Hz is good for superhexagon but touchscreen controls will ruin all the benefits of more Hz, maybe if you carry your arcade controller with you at all times.... Does this support 1ms or under peripherals? If not the 120Hz is pointless. Touchscreen controls are always going to ruin it. If they wanted to make it "for gamers" I would expect to see some physical controls, otherwise it's just another phone. ikesmasher, Nobina and iABDOzz Mustafa like this. Best looking logo in the biz. I always wondered what the acronym TPNGATWIE stood for, Thanks man, I couldn't find it on Google. A mobile gaming device is one of the last things I'd ever want but as far as flagship phones go, given it's specs, I suppose 700 balloons isn't too unreasonable these days. Not that I'd ever dream of paying that much for something that is essentially just a smartphone. Great specs for price to be honest. It’s a real shame it isnt water res though, for me that’s just a deal breaker not that I’ve ever dropped my phone in water but I swear in getting rain on them while in your pocket ruins them without it.